This is one of those weapon models being in the game since the Wotlk beta. Sadly they didn't need that many items, that's why we never have seen them ingame (except of some being wielded by NPCs). 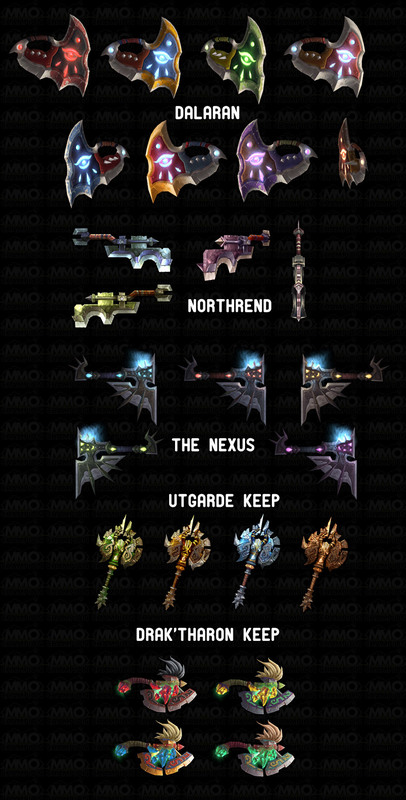 After rediscovering a whole bunch of screenshots back from Wotlk beta (see here for 1h axe designs), I was hoping they get implemented in the 5 man instances in 3.3, and it came (partially) true! Batman was a rouge, and so after rouges could use axes, this was the result. My question is... Why does this have higher top end dmg than the Seven Fingered Claw, the new fist weapon? Same speed and dps... Seems a little biased towards the ax, doesn't it? I noticed that, if you enchant this weapon, it will keep its original glow on the one part of the blade, but the larger part of the blade will display glow effects from enchants you put on yourself. This is one of 3 possible slow 1H weapons dropping from the Heroic versions of the 3 new dungeons in Icecrown Citadel. Seven-Fingered Claws is a trash drop from both The Forge of Souls and the Pit of Saron. Nighttime is a drop from Bronjahm, the first boss in The Forge of Souls. Black Icicle drops from the chest at the end of The Halls of Reflection. All three of these weapons are superbly itemized for Enh Shaman and Rogues, and may also interest Hunters (of course). Slow speeds, crit, and plenty of AP make them all very attractive. To see which one might be best for you, based on your current gearing needs, take a look at the linked comparison of all three. Yup Upgraded from Dual Tankards last night with this in offhand and Seven Finger in main hand (Enhancement Shammy). Rawr thinks this is a better main hand though, but due to restrictions cant do much about that. Esp nice for Orc DW Frost DKs. Mine's got two, haven't seen such a big grin on him in quite a while. do these weapons mount on ur back when u put them away? My rogue just got Nighttime. It's a wonderful upgrade; but as it's his first axe ever, he had to go back for training, then find a safe place to skill up. In my case, Borean Tundra. Yes they can, the trainer is in Orgrimmar. His name is Gamon. Who, hunters? Try playing a hunter - won't take too long to level a troll or orc and get 9s on their own, and TRY IT. Then again, just go onto the official WoW site and see what weapons are available to hunters. I'm a Frost DK DPS specced and trust me. You don't need anything more. One of the best tools to make someone sleep. If i lose out on this to a Ret Paladin one more time I'm going to kill someone. Fifth time today. Yours, a %^&*ed enhance/ele dual spec shaman. Pretty much the best (if not the only) axe for Rogues, since the ones before this were for tanks. No one fears the Night Stalker in the day. I think this item is a referance to the time of day when the sun is below the horizon. I happen think it is a referance to the time of day the sun is below the horizon. For being a 16% droprate I remember this being a pain in the tail to get. I was the rogue looking for 2 of these for my orc combat rogue with axe specialization. They look especially nice with a good b-zerk chant on emm too! Although not perfectly, this axe matches pretty well the Blackrock Plate.